Hemel Town keeper Laurie Walker made some stunning saves in the second-half against Oxford City on Saturday. (File picture by Marc Keinch). 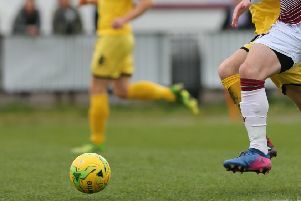 After two successive victories, it was a disappointing day for the travelling Tudor Army as they watched their side slide to a 2-1 defeat against Oxford City on Saturday. In what was very much a mid-table end-of-season clash with neither side having anything other than pride to play for, but the early exchanges made for an entertaining first-half. Hemel, in 14th place prior to the game and level on points with 13th-ranked Oxford, had a couple of half chances before the hosts started to up their game. The front two of Brandon Thomas-Asante and Luton loanee Kabongo Tshimanga gave the Tudors back-line a torrid afternoon although they were guilty of missing decent opportunities. It was Hemel who took the lead after a brief spell of pressure. A free-kick from skipper Jordan Parkes was played out wide to Kavan Cotter, who crossed to the back post where Herschel Sanchez Watt arrived unmarked. His header hit the post but dropped to strike partner Arel Amu, who poked the ball home for his third goal in successive games. This should have been enough to give the Tudors a half-time lead but City attacked straight from the re-start and with Hemel’s back line at sixes and sevens the ball was fed across the face of the goal, Tom Hamblin blocked a shot from Reece Fleet but it deflected to Bobson Balling who had time to pick his spot with what proved to be nearly the last kick of the half. There was just time for Hemel to kick-off before the referee blew his whistle. The Tudors have made a habit of surrendering leads of late, so while it was frustrating to concede with seconds left, it wasn’t much of a surprise for the loyal travelling band of supporters to find themselves pegged back. After a bright start to the second period it got worse for Hemel when they fell behind just before the hour mark. They had been struggling against City’s pace up front all afternoon and Thomas-Asante gave them a warning when he hit the post when it looked easier to score after good work by Tshimanga. It was the Luton prospect who gave City the lead moments later when he robbed Jacques Kpohomouh on the edge of the box before smashing the ball past keeper Laurie Walker. After this, Hemel huffed and puffed but never really looked like getting back into the game, although Kyle Connolly did have a goal disallowed for offside on 65 minutes. Apart from this they created little, while Oxford continued to make and miss chances. Walker made several excellent saves which helped keep the visitors in it. City’s Kyran Wiltshire was guilty of a glaring miss when he rose unchallenged to meet a corner but headed the ball high and wide. City saw the game out comfortably in the end and really should have added to their tally as Hemel ran out of ideas. 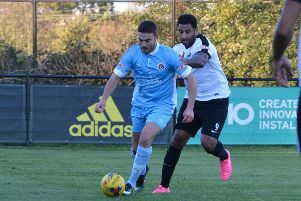 In the end, it was a disappointing result against Tudors’ boss Joe Deeney’s former side that leaves Hemel fixed in 14th place in the National League South table. Many of the Tudor Army were reflecting on a season that promised much but is ending with a bit of a whimper. Deeney will still be looking to get as many points on the board before the end of the campaign and finishing with a flourish to give the faithful something to cheer about. With four league games left to go, Hemel turn their attention to the cup this Tuesday night (kick-off 7.45pm) when they travel to National League outfit Boreham Wood in the Herts Senior Cup. They then host relegation-threatened Truro City this Saturday at Vauxhall Road. Hemel line-up v Oxford: Laurie Walker, Kavan Cotter, Kyle Connolly, Jordan Parkes (captain), Tom Hamblin, Jacques Kpohomouh (Joe Howe), Kieron Monlouis, Mark Randall (Jason Williams), Arel Amu, Hershel Sanchez Watt, Daniel Rowe. Subs not used: Jack Snelus, Danny Boness. Tudors’ man of the match: Laurie Walker.